I picked Alyce up from preschool today and she ran over to me, a concerned look on her little face, and said, Mama, a bead fell in my nose. Oh dear. Her teacher looked surprised, assured me that there was nothing in the gym she could have stuck up her nose (where they were playing at the time), not realizing, as I learned a little later, that it was four hours earlier that Alyce had found a bead in her nap bed and done the only thing that made sense to her little head: shoved it high inside her nose. I'm really surprised this doesn't happen more often. Alyce was in a bit of pain after four hours of hiding a bead in her left nostril, but she played it strong, not wanting anyone to do anything that might hurt. She gave a C- effort blow of her nose, trying not to make any real waves in that nostril. I can't begin to describe how little she seemed at that moment. I could tell that she had been waiting for me to pick her up so that she could finally say something about the bead that fell into her nose (nice spin, Alyce). For a moment I felt a little sad for her old preschool in Delaware, where I know she would have felt comfortable enough to tell her teachers anything and everything. But she'll adjust, just as she always does. In fact, she's already declared that Piper is her new best friend (sorry, Lexy). But let's return to the bead, so we can all learn a little something new. Having tried the nose-blowing again and the old flashlight-and-tweezers trick (that worked for us a couple of years ago in the Cranberry Incident of 2009), I realized that we were going to have to head to the hospital to get this thing out. When I finally saw the bead using the flashlight, the size of the thing frightened me. I was also not surprised that it was purple. My mum, in her infinite wisdom, suggested that I call TeleHealth Ontario to find out if the on-call nurses had any tricks. The nurse was very serious, asking me if Alyce was breathing alright (she hadn't stopped talking, so I figured breath wasn't an issue) and if she was upset and feeling sick (she was already eating her second helping of peanut butter, so again, she was fine). I explained that Alyce was a perfectly happy and healthy three year old who happened to have a very large bead in her nose. I didn't expect any of her tricks to work, but I stand corrected. Even Alyce thought it was awesome. So parents (or anyone who knows a child who "falls" things up their noses), study this move! 1. Find Elmo or any appropriate squeezable dolly. 2. Pour a little saline solution in the offending nostril (I used a medicine dropper). This will make the bead a bit slippery. 3. Using your finger, squeeze the other nostril closed. 4. Inform the bead-loving child that you need to blow some air into her mouth. Wait for giggles to stop. Ask her to open her mouth a little. 5. When she opens it up wide and finds herself very funny, remind her that you asked her to open her mouth only a little. 6. Place your mouth over her mouth, and still squeezing the other nostril, breathe a puff of air into her mouth. It kind of feels like CPR. 7. Jump up and down when you realize the the bead moved a little bit! 8. Wait for giggles to stop. 9. Repeat step 6 until your breath pushes bead all the way to the entrance of her nostril. 10. With the bead almost out, push the bead out with your finger. I'm telling you, I have never been so impressed. I still can't believe it worked. I am so grateful to the nurse who gave me the suggestion. I wish I could connect with her again and say thank you. Alyce has promised not to put anything else her nose, including, but not limited to, the following: rocks, peas, marbles, fruit, or beads. You just never know what adventures you'll face. Note: I've been trying to upload a photo of the offending bead (because I know you want to see it), but I'm having technical issues. I'll post it once the problems are solved! It's up! Update: Photo added! *Keeping in mind that I don't actually have any idea about what I'm talking about. 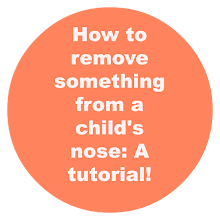 If your child has shoved something in his or her nose, probably best to call a doctor. The coolest thing I have read ALL WEEK. HANDS DOWN. That was about the best tutorial ever. Forget all those fancy craft tutorials every one does... this was the best! Reminds me of a class I took at university with a world-famous professor of "bible as literature" (historical significance of eras during which it was written, the "voices" of the writers, etc...) Anyhow, we were discussing divine omniscience (esp. as concerns the eating of the forbidden fruit.) The professor compared it to telling a preschooler not to put a bean up her nose. You can tell her not to do it and, deep down, you know she will. Profound biblical commentary and interpretation, indeed! Finally...if I had to read one more tutorial on how to make pickles, I would have screamed! I've called telehealth so many times; I'm sure moms are the number one clients; I swear, they know my kids' names before I tell them. I teach kindergarten so this might actually come in useful. Love your space! M.Bloom, I'm happy you liked the post. Sometimes I watch Alyce and I know she's thinking about doing it again, sizing up a rock or a nut. I think it might be my destiny. KGH, I never imagined telehealth would be of any help because they just always tell you to go to the ER (in my experience). I was very pleasantly surprised. Sarah, I can imagine how tempting it is to put a tiny piece of candy up one's nose. It's one of the many reasons I've never given Alyce a jelly bean. And Kristen, one of my fears is that Alyce will transfer her nose obsession into trying to stick things up her little sister's nose. Shira would probably be willing, and I can only imagine what we might find in there one day. Thank you! Thank you! Thank you! You just saved me a trip to the ER!! The bead popped out on the first blow! You are my hero!!! Stephanie! I'm so happy to hear that it worked! I hope there was as much giggling with your little one as there was with mine. Also, my Alyce stuck a gem sticker up her nose just last week. Will she never learn? Totally worth the read, SOOOOO funny! I tried it on my son, and we didn't have success. I think it is because he is six and the bead wasn't large enough to block the nostril. Thanks for this write up though... totally made our night! Definitely my hero. Did this in the er parking lot thinking what the heck if it didn't work we were here. The bead popped right out!!! I'm so happy it worked! That made my day. so cool! although the giggles did not come, the crying actually helped cause she had to open her mouth. that sucker whooshed right out on one blow! Thank You!! I'm so happy it worked! IT WORKED!!!! Thank you so much. I'm sharing this everywhere. Hooray! I'm so happy it did! We have yet to experience a bead, but did have to have a Tinkerbell shoe removed at the er... followed by a bitten off piece of eraser. The first offense was a wadded up piece of paper..... my little man went through a period of 6 months where he wanted to stick everything up there. I'm placing this in the permanent memory area of my mommy brain. What is with our children? A tinkerbell shoe? What was he thinking? My 3 yr old girl just put a big bead inside her nose.. i googled and found your tutorial and after 4 blows (since she was crying with her mouth wide) the little bead popped out.. I'm so happy to hear that! Hearing back from all of you brings such a smile to my face. Noses are just so appealing, aren't they? Thanks to you my son's nose is now thankfully bead free and we avoided a potentially horrible trip to the emergency room. Plus, you saved my sanity - so, you know, thanks and all that. Love this post! And two years later, you are still helping people! Found this today and it worked on the second blow! THANK YOU! And, yes, there were giggles from both of us. Mine was out of relief. She just thought it was hilarious that the bead came flying out! This is so exciting! I can't tell you how happy this makes me every time I hear about this working. Glad to hear there were giggles, too. Thank you so much for this tutorial. My grand daughter did it today. We were headed out to the ER when I thought of googling it on the internet. Your blog was a god send. I couldn't believe how quick the trick worked. It flew out so fast it hit my cheek and made her giggle. I hope she never does this again. thank you so much for sharing. Thank you so much. She is 2 and was not co-operating but it worked. l can't imagine how much we could have paid for this at 2200hrs. Time to enjoy thy sleep. Mahalo! Totally worked! Laying down easier than sitting up. :) I'm glad I found this quickly, she was trying to dig it out with a floss stick! Thank you so much, this tutorial saved us from going to the ER. I figured me blowing a bead out was better than some strange nurse.... 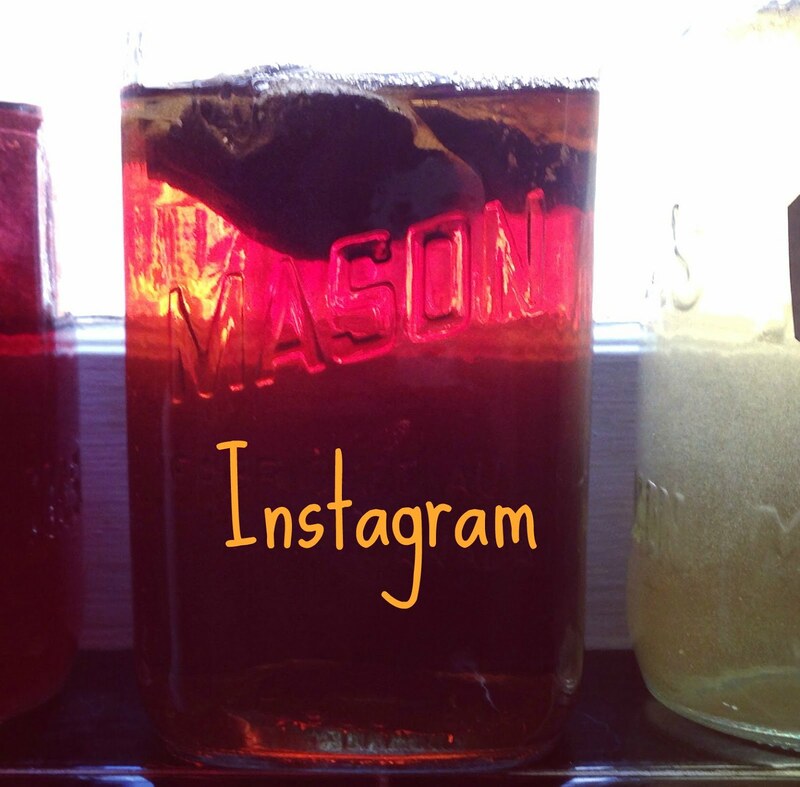 It worked great and everyone I've told is so impressed! thank you so much,this procedure worked for us. Lil girl had pushed bean up her nostril. It worked! Thankx a bunch! Another confirmation that this works! First one or two puffs didn't budge, so I put some more saline (Nasal Irrigation) solution, and quickly gave 3 puffs, blew right out of her nose! She is almost 3, and it didn't even phase her! Copyright 2010 Most Days I Win. If you would like to use something you find here, please just ask. Simple theme. Powered by Blogger.